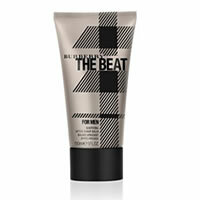 Burberry The Beat For Men Aftershave Balm is a light and invigorating moisturiser for men that conditions and cares for the skin. Vibrant cedrat, black pepper, and violet create an initial burst of freshness that melts into an elegant, timeless heart of leatherwood and vetiver bourbon. The effect is a mirror of modern Burberry masculinity fueled by the dynamism of music and fashion. The scent exudes rhythm, style, and sensuality.